Nothing to see here! 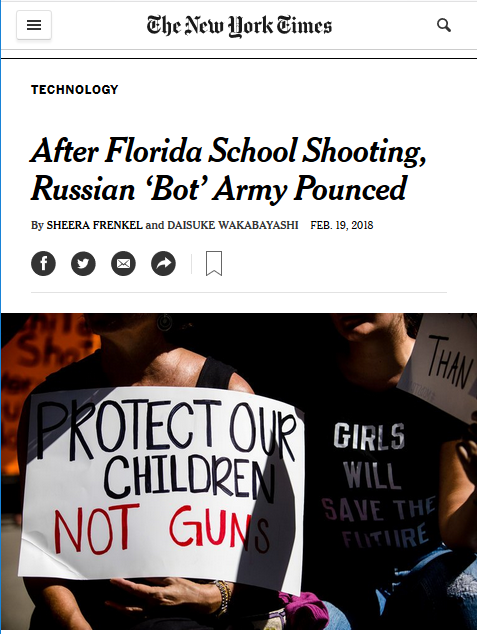 There’s a problem in our society — systemic racism in American media — and rather than an examination of whether it’s affecting coverage here, what the listener gets is yet another boilerplate story about “Russian bots,” the degree, scope and impact of which are wholly unknown, and likely inconsequential. 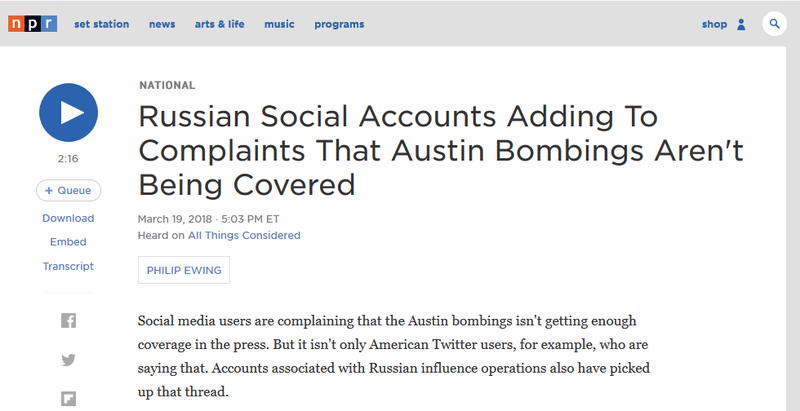 Hesitant to cite Hamilton 68 by name (perhaps because its co-founder mocked this very kind of story a few weeks prior), NPR reporter Ewing simply cites “dashboards and online tools” as his source. Which ones? 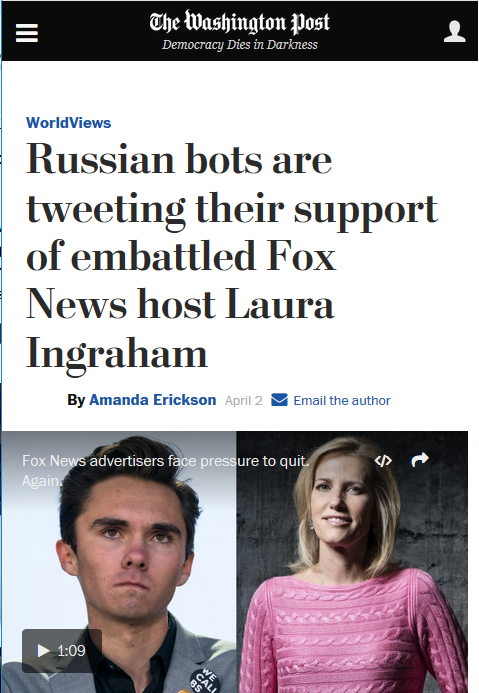 It doesn’t really matter, because “Russian bots support X” reports are a conditioning exercise more than a story. 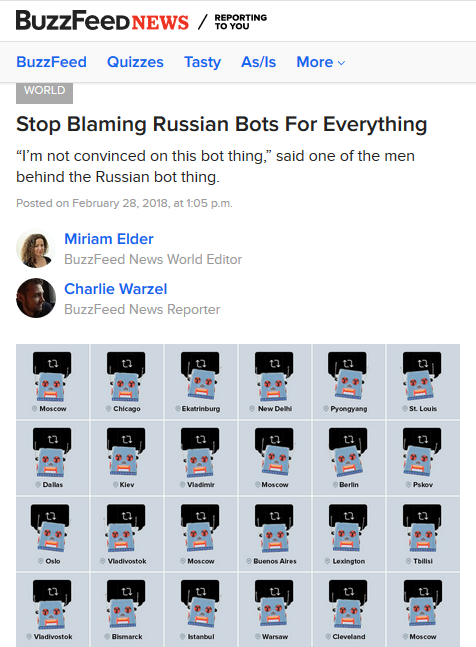 The fact that this paint-by-numbers formula is still being applied weeks after the primary source’s co-founder declared himself “not convinced on this bot thing” and called the story “overdone” demonstrates this. The goal is not to convey information or give the reader tools to better understand the world, it’s to give the impression that all unrest is artificially contrived by a foreign entity, and that the status quo would otherwise be rainbows and sunshine. And to remind us that the Enemy lurks everywhere, and that no one online without a blue checkmark can be trusted.